iMovR's newest entry in the mid-tier range, the Uptown is an impeccable marriage between cost and quality. With a digital programmable controller and an unprecedented array of customization options – including two table top thicknesses, five tabletop sizes, 11 tabletop colors, two base colors, and optional grommet-mounted power+USB nodes and wireless cell phone chargers – the Uptown Adjustable-Height Desk offers the best value for any electric standing desk, and clearly is, as iMovR claims, "the most customizable adjustable-height desk in the world." Available standard woodgrain colors include Mahogany, Hayward Cherry, Shaker Cherry, Almond Cherry, Light Maple and Urban Walnut, while Black, Designer (frosty) White, Warm White (beige), Haute Gray (putty) and a stunning Shark Gray are the available solid colors. UpTown's strongest feature is its vast array of standard customization options- more than any other desk on the market today. Rounded out with high-end features like 3D laminated table tops, digital readout controllers with three memory presets, the quietest motors we've ever seen (<41 dB), and a rare acceleration/deceleration damping feature, the UpTown offers prospective deskers an exceptional value for their dollar. The UpTown comes in four different sizes, but uses two different bases to achieve this. The wider base will only be able to adjust for 71" and wider tops, while the narrower base will accommodate tops between 42" and 59". This reduces the base's adaptability as compared to iMovR's other ThermoDesk and Omega Desk options that cover a slightly smaller range of desktop widths but with a single base. iMovR's ThermoDesk UpTown Adjustable Height Desk offers users a ridiculous amount of variety. This extreme personalization combined with its value pricing make it our favorite mid-tier standing desk. Anyone looking to start standing during their work day would be remiss to overlook the UpTown adjustable height desk. As one of the leading manufacturers of high-tech, adjustable height desks on the scene, iMovR has already developed the broadest offering of desk models as compared to any other active office furniture maker, and the hits keep on coming. The UpTown is their new “value leader” mid-tier product: eminently affordable, robustly featured, and offering an unprecedented degree of customization. 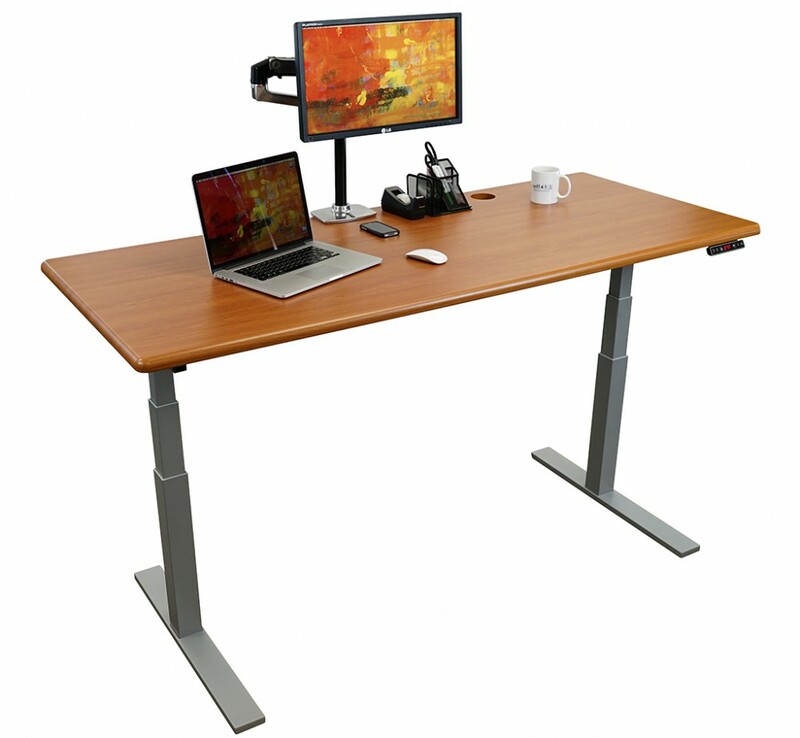 Just What is the Adjustable Height Desk “Mid-Tier”? The mid-tier bracket of adjustable-height standing desks features a typical price range of $600-$1000, and includes popular models such as the GeekDesk, MultiTable Mod-E, Jarvis, Uplift, Uprise, and S2S, as well as iMovR’s Denali and Olympus. It’s the most crowded tier and it has been getting exceedingly competitive as of late. It’s important to note that while some of these desks are frequently advertised at lower prices (for the base only), we include the price of the tabletop for our apples-to-apples comparisons. The UpTown comes in with pricing at the low end of the bracket (the standalone UpStage 30 base it is built on sells for only $499), yet with features typically found only at the high end of the bracket, if not in the top-tier. This includes extremely good stability, ergo-contouring of the tabletops, 3D-laminated desktop surfaces and grommet holes, a very solid warranty and a digital hand controller with three programmable height presets. Perhaps most notably it is the quietest desk we’ve ever tested, coming in under 41 decibels. Where most mid-tier electric desks generate a minimum of 60 dB, to as much as 75 dB for some older models, even top-tier desks aren’t this silent. The UpTown has taken the crown for being the quietest desk on the market today. Top-Tier: iMovR’s top sellers - the ThermoDesk Elite and Omega Everest - both entirely made-in-America, designed around the stalwart iMovR Reliant electric base, and featuring the strongest warranty in the business—ten years. Both are configurable for sit-walk, sit-stand or extra wide (72” and 83”) sit-stand-walk configurations. Competitors in this category include a few made-in-America venerables such as the Anthro Elevate and Adjusta. Mid-Tier: This is where the UpTown—and its SteadyType-equipped sister product, the Olympus—live. The mid-tier is the most crowded segment of the market with competitors such as the GeekDesk, Mod-E, S2S, Uprise, UpLift and Jarvis. Bottom-Tier: iMovR is known for manufacturing top-quality products but that hasn't kept them from from introducing some low-cost units as well. Chiefly these are the compact Upsilon, with it's 24" deep desktops, and the frugal, yet surprisingly robust Ellure, with its crank-handled, manual base. Electric competitors in this price tier include some bottom-dollar, low-quality products that get the job done but tend to have relatively short useful lives as well as some aesthetic shortcomings, such as the IKEA Bekant and Autonomous SmartDesk. 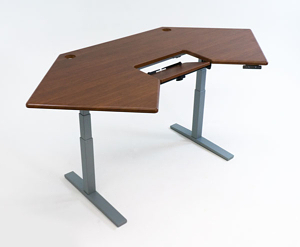 Manual desk competitors include Multitable's ModTable crank desk. Reaching 50" is important, but iMovR is going a step farther; the precision dual motors of the UpStage 30 base can lift an impressive 360 lbs. 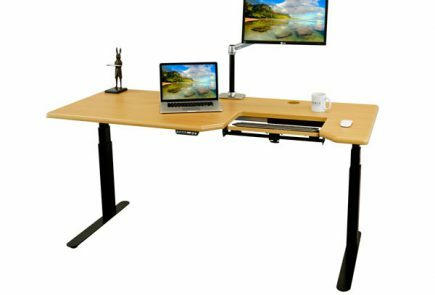 No other two-legged adjustable height desk in the mid-tier, with the exception of Electra and Uprise, has as much lifting capacity. In fact, we don’t know of a desk in even the top-tier of two-legged desks that rivals UpTown’s lifting capacity. While most people are unlikely to have 360 lbs worth of tabletop, computer, monitors and other desktop detritus to pile on this base, being overpowered directly translates to the long-term reliability of the motors and linear actuators (read more here). As a rule of thumb, bases with higher lifting capacities come with longer warranties, a key expression of the manufacturers’ confidence in their products’ reliability. Indeed the considerable warranty on the UpTown is lifetime on the frame and five years on all other components. Though built in China like most all mid-tier electric bases, the plant that contract manufactures the UpStage bases for iMovR is state-of-the-art and known for its high-precision, high-reliability linear actuator componentry. The UpStage 30’s travel speed averages around 1.5 inches per second, which is a little better than most of the competition in the mid-tier. However, it’s rare at this price point to see an acceleration and deceleration dampening feature. And as mentioned above, the base is the quietest we’ve ever tested in our labs, registering under 41 decibels. To put that in perspective consider the Jiecang base, another Chinese-made product widely used on mid-tier desks including the Jarvis, S2S, and Uplift 900. The Jiecang bases register at about 60 dB (decibels being a logarithmic scale), making them four times noisier than UpTown, despite moving up and down at about the same transit speed. Quiet as the desk is it’s actually kind of cool to hear it “wind up” and “wind down” as the tabletop height is changed, reminiscent of faraway jet engines spooling up and down. But the real benefit of the dampening feature is that your coffee is unlikely to slosh out of its cup and pens less likely to roll off the desk when it’s on the move, as compared to desks that lack this feature. At first blush it appeared that iMovR did something magical to get a single base to telescope in width to accommodate 42”, 47”, 59”, 71” and wider tabletops. In point of fact there are two different bases. The UpStage 30N (“narrow”) is used with the 42”, 47” and 59” wide tops, and the UpStage 30W (“wide”) is used with the 71” and wider tops. The difference in the two frames comes down to the lengths of the crossbar components. So unlike the other ThermoDesk and Omega Desk products that use a single base to accommodate all tabletop sizes, the UpTown uses two different bases. The upshot of this design choice is the extraordinarily wide range of tabletop dimensions the buyer can choose from. 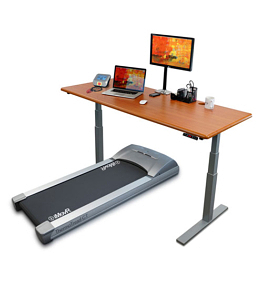 It should be noted that for those looking to build a sit-stand-walk workstation the UpStage 30W with the 71” (or wider) tabletop leaves plenty of room for a full-sized walking treadmill and a full-sized office chair to be placed side-by-side with room to spare. Regardless of the base version, the UpStage is an extremely rigid design, featuring heavier and thicker feet to greatly reduce warping and wobbling in the leg. This in turn makes the base one of the most solid we’ve ever tested for either standing desk or treadmill desk use. Given iMovR’s impending release of their first treadmill base – the ThermoTread GT – we’re not surprised to see the measures they’ve taken to maximize stability. The UpStage base’s lateral and longitudinal stability are markedly superior, especially when contrasted with the commodity Jiecang base. It also reaches higher, adding stability at loftier desk heights by creating more overlap between the telescoping leg segments. To learn more about how the UpStage 30 base compares to other standalone bases we've tested and reviewed, see our DIY Guide to Standing Desk Bases. 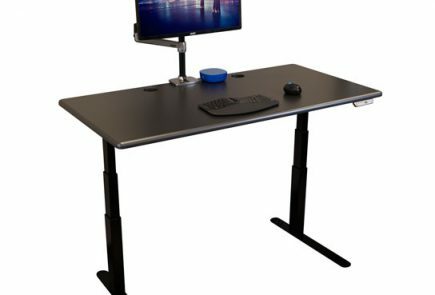 Shop around and you’ll find that with rare exception, standing desk manufacturers typically offer an array of different tabletop size and color options. That’s to be expected. But this is the first time we’ve seen a selection of tops for a single desk line with this many options, at least outside the contract furniture world. Historically, iMovR has offered thin (3/4”) tops on their lower-cost units like the Electra and Upsilon, and conference table-thick (1-1/8”) tops on their higher-cost units like the Omega Denali, Omega Everest, ThermoDesk Elite, and, no surprise, the Synapse meeting tables. With the UpTown line, and for the first time, iMovR is offering both thickness options within a single desk line. Shared characteristics of the thick and thin tops include the hermetically-sealed 3D lamination that wraps around the contoured edges of the desktop and even through the grommet holes, extending the life of the product (keeping damaging moisture from degrading the wood over time), and giving the desktop the appearance of having been fashioned from a single piece of hardwood. Both have the same dual grommet holes setup, which can accept optional, flush-mounted upgrades like nodes that supply power through AC sockets or USB ports and Aircharge wireless cell phone chargers. The Surf(x) 3D laminate that iMovR uses is significantly more resistant to scratches, dings and chemicals than the conventional high pressure lamination used by most competitors, and dramatically better than the powder-coated paint used by some of the low-cost competitors. Hence the unusually long five year warranty on all iMovR tabletops. Available standard woodgrain colors include Mahogany, Hayward Cherry, Shaker Cherry, Almond Cherry, Light Maple and Urban Walnut, while Black, Designer (frosty) White, Warm White (beige), Haute Gray (putty) and a stunning Shark Gray are the available solid colors. In addition there are over sixty more custom color options for bulk institutional buyers to match the décor of their existing furniture as closely as possible. See the complete color palette. So how do they differ? The thinner “slim top” is pre-drilled for the wood screws that hold the tabletop and hand controller to the base, as well as for the optional ThermoDesk Stowaway Ergonomic Keyboard Tray. It is lighter and therefore costs a bit less to manufacture and ship around. Some people also prefer the slimmer, modernist aesthetic, or simply want to save a few bucks. The slim top option comes in widths of 42”, 47”, 59” and 71”. The thicker “select top” version includes recessed nuts for installing the base using machine screws. This not only makes it easier to assemble the desk but it prevents the degradation of the screw holes that can come from taking the desk apart and reassembling it too many times. 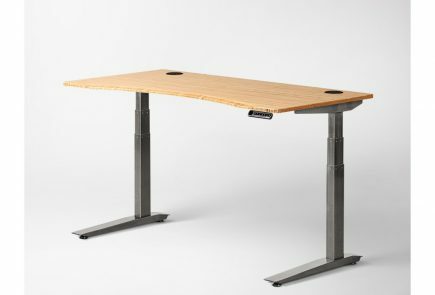 As a general rule with any adjustable-height frame, a thicker tabletop will modestly enhance lateral stability of the desk, in particular at widths greater than 59". 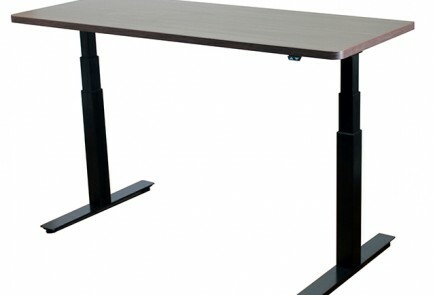 NOTE: iMovR just released nine new CORNER DESK options for the UpTown and Olympus desk lines. The UpTown is also available with optional caster wheels. These let you effortlessly move your desk across a hard or carpeted floor. They let you reposition your desk in your office, and allow you to more easily access the space behind the desk. Best of all they lock in place, so you can have a mobile desk when you want to move, and a stationary desk when you don't. Note: the casters add 2.5” of height to the desk, a bonus for taller users. When adding casters we definitely recommend the iMovR Advanced Cable Management Kit – including its 7-outlet surge protector power strip with 12’ cord - to go with it. By keeping all the cord slack in the Kit’s 24”-long tray you be sure to keep loose cords out of the way of the wheels. The UpTown has been a core product of iMovR's every since its introduction two years ago. With its increasing popularity the company has been able to steadily lower its retail price, making it even more affordable. It stands up very well against other products in the same price tier, that tend to be of an earlier technology vintage, typically noisier, less stable and less reliable than the UpTown. On features and aesthetics it even stands well against most products in the high tier, many of which can cost two to three times as much. Like all iMovR desks, the UpTown's stunning 3D-laminated desktops are made in Michigan, so the main thing that distinguishes it from iMovR's own top-sellers, the Elite (and SteadyType-equipped twin, the Omega Everest), is that the base is made-in-China versus made-in-USA. That said, the UpStage base used in the UpTown tops the charts as the highest-quality base imported from Asia today, and has identical an lift capacity (265 lbs) and nearly identical speed and noise characteristics as the Elite and Everest. So if the Chinese-made and American-bases are so similar in specifications, what other reasons would there be to pay up for the latter, other than nationalistic sentiments? The difference comes down to comparing the production sophistication of any imported base—including this one—with the tight machining tolerances of the robotically-manufactured American bases. With something like a linear actuator (i.e. the motorized desk legs) moving a lot of weight up and down every day this difference is most important at wider frame widths (and why the Elite and Everest are the only iMovR desks that are sold with 83" wide desktops), where the ability to withstand high "side-loading stresses" is paramount. And this is also reflected in the twice-as-long warranty term of the American-made product. To learn more about these nuanced differences check out our primer on Do Weight Lift Ratings on Electric Desk Bases Really Matter? 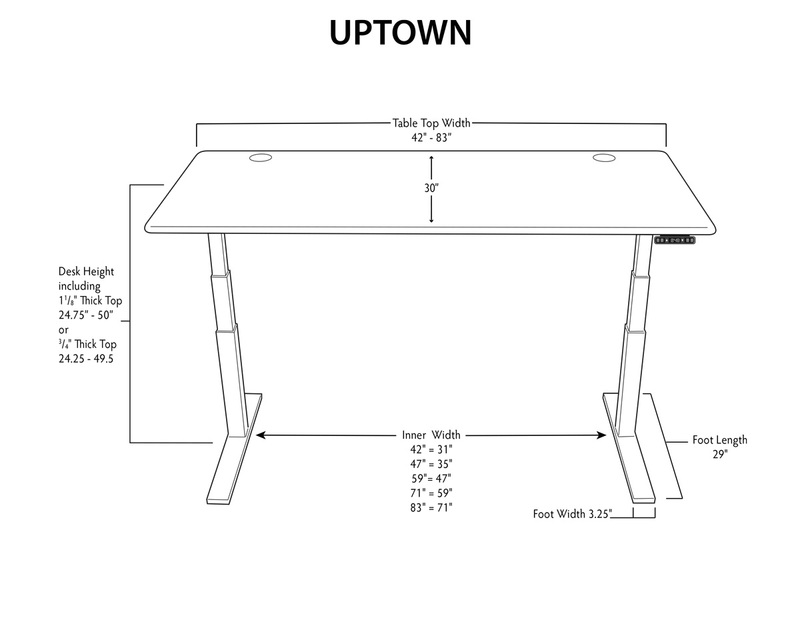 UpTown desks are made to order and arrive within twelve business days of order placement. UpTown desks are shipped palletized by freight from Grand Rapids, Michigan. The standard shipping price for UpTown desks is $99. iMovR also offers a variety of delivery upgrades including room of choice delivery and factory pre-assembly. For a mid-tier product the UpTown has an excellent warranty of Lifetime on the frame, and five years on the tabletop, moving parts and electronics. 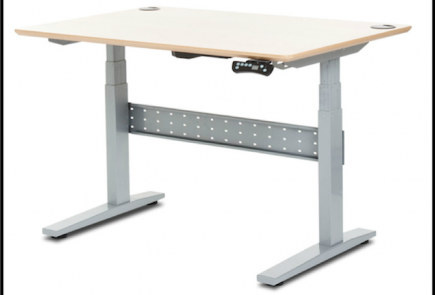 Check out our comprehensive Comparison Review of Electric Adjustable-Height Desks for a side-by-side feature comparison.